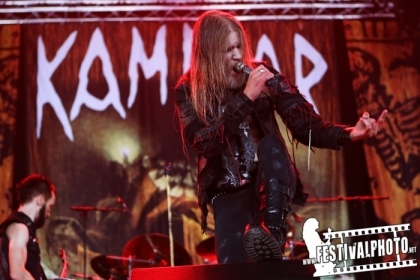 With the backflag stretched and the torches ablaze, the show can go on with Kampfar on the Temple stage! The scenery was wonderful when the Norwegians appeared. Unfortunately, a pretty bad sound (of the classic « I hope you looove double bass drum » kind) and a frozen performance (not in the good, trve black sense of the word though...) quickly damaged my initial enthusiasm, given that the cold and subtle harmonies of the band’s music and its raw power have been its trademark for years now. However, what a possessed frontman we had there, doing the show all on his own! Indeed, it was fascinating to watch Dolk scream like a demon and then unleash his unique brand of clear vocals before walking around while haranguing the dedicated crowd. After only a minute, you could tell that Kampfar is the fight of his life and that he will never surrender to any trend. No matter how hard you’ll try, you’ll never be more Metal than Dolk, because they simply don’t do guys like him anymore. Claws out, he never rested and kept asking the fans to give him the energy he needed to go on, headbanging like a madman until the very end. So, I recommend every metalhead to go see Kampfar live at least once in his lifetime, in honor of Dolk and the great art that he’s been creating for the last two decades, even if I personally like it better when I’m at home with my headphones on. Respect.